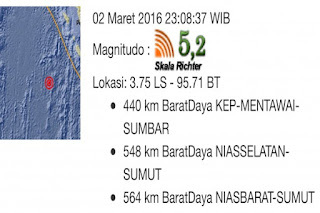 Gempa susulan di Mentawai kembali terjadi: Gempa susulan kembali terjadi di Kepulauan Mentawai, Sumatera Barat, Rabu malam berkekuatan 5,2 Skala Richter. Informasi diterima lewat SMS dari Badan Meteorologi, Klimatologi dan Geofisika (BMKG) di Padang, Rabu malam, menyebutkan, gempa itu terjadi pada pukul 23:08:37 WIB. 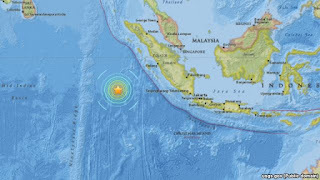 Indonesia issued a tsunami warning on Wednesday (2/3), after a huge earthquake rocked the area off the west coast of Sumatra. The Meteorology, Climatology and Geophysics (BMKG) Indonesia, said the warning was issued to West Sumatra, North Sumatra and Aceh after the earthquake measuring 7.9 Richter scale was detected. According to the United States Gelogi Survey (USGS), the epicenter was in the sea at a depth of 10 kilometers and about 808 kilometers southwest of Padang. There are no reports of damage and casualties. However, the more shallow an earthquake occurs, the greater the damage that may be caused. USGS initially set the quake measured magnitude 8.2 but later lowered it to 8.1 and finally 7.9 SR SR.